Immerse yourself into a world where magic and myths exist! Have you ever heard of the genie and the magic lamp? You must’ve come across this in the story of Aladdin, where he coincidentally found a magic lamp, which housed a genie. A magical being, capable of granting three special wishes. Genie Jackpot Instant is themed on this myth and story. The game consists of 5 reels and 5 rows, filled with objects that you have to pick from to grab an instant win! Start picking your lucky symbols off the grid and stand the chance to grab a quick win or unlock a bonus round. Each yellow carpet on the grid reveals a symbol, if you manage to get three, four or five of the same symbols horizontally, vertically or diagonally, you seize great wins! But before this, set your bets on the bet field using the plus or minus buttons. Amount of Paylines Selection: No paylines present. Coin Values: Set your stakes using the + or minus buttons in the bet field. When a yellow carpet turns red, this feature is triggered. By picking on the chests, they will open and reveal a cash prize. Keep playing until the Collect Card is revealed and collect your wins. 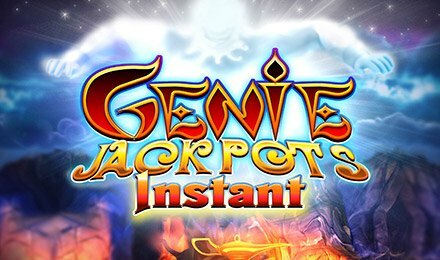 On Genie Jackpot Instant, reveal three magic lamps and trigger the feature. Pick a magic lamp and receive an awesome cash prize. If you enjoyed this Aladdin themed slot game at Wicked Jackpots Casino, there’s more to enjoy right here! Choose from the wide selection of slot games, the theme that fits you the most, launch it and get spinning!